A Laser Harp…keytar…synths upon synths….Southern California’s desert sky will be lit up this spring like never before when prolific and celebrated electronic music pioneer Jean-Michel Jarre will return to the United States to perform his critically acclaimed ‘Electronica’ show at both weekends of Coachella this April (Friday 4/13 and Friday 4/20). 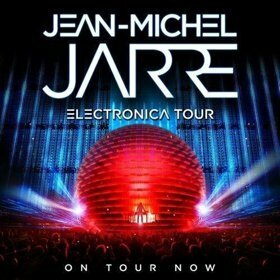 In 2017, Jarre brought his ‘Electronica’ world tour to North America for a nine-date outing, marking the first time the Grammy-nominated artist and French electronic music composer and producer ever toured this side of the Atlantic Ocean in his almost 50-year career. Newsweek‘s Jeff Perlah noted that “At Radio City Music Hall [in New York], Jarre’s show was sonically and visually stunning (5/24/17). Coachella marks his debut festival play on North American shores. Surrounding the festival, JARRE will embark on a short tour visiting such cities as Dallas, Vancouver and Seattle. He’ll also return to Houston on April 10, where he last appeared back in 1986 performing a one-off city-scale concert celebrating NASA’s 25th Anniversary. Over 1.3 million people gathered to share in a moving commemoration of the Challenger Mission setting a Guinness World Record. The North American dates follows below. Jean-Michel Jarre personally designed his impressive stage show featuring state of the art production, perception-defying mobile LED panels and immaculate laser lights which he brought to North America as part of his ‘Electronica’ World Tour last year to rave reviews, with Dancing Astronaut‘s Matt Sia stating, “Jarre’s live show is something that seems out of the distant future, and is an essential experience for any fan of electronic music’s capacity to innovate” (5/11/17) and Liisa Ladourceur from Now Toronto adding, “Jean-Michel Jarre’s first Canadian show was the stuff of digital dreams” (5/10/17). Jarre is a four-time Guinness World Record holder for largest concerts ever performed, a 2017 Grammy nominee, with more than eighty million albums sold, and UNESCO Goodwill Ambassador renowned for his one-off groundbreaking events at historical landmarks across the world. He’s one of the first artists in the world to perform electronic music as we know it today. On this tour, he’s showcasing music from his two-part LP Electronica and most recent release Oxygene 3, alongside classic material from milestone albums such as Oxygene and Equinoxe.